This looks nice and glassy without feeling sticky. Plus it has a minty-fresh taste. This has a nice, long-lasting barely-there color, and doesn't feel tacky or sticky. Love the subtle mint flavor, and the pretty shine. 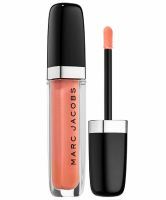 This provides a pretty, shiny finish without any of the gross stickiness factor that plagues a lot of other glosses.